Wow!! 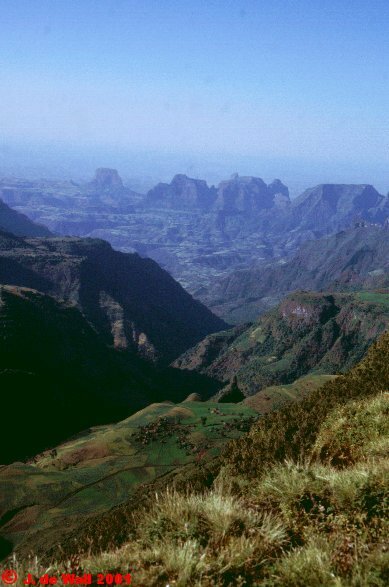 the Simien mountains are really something special. I spend 9 days there in the mountains and had a truly brilliant time! I hope the pictures speak for themselves. Pic 1 and 2: great views are everywhere!! These ones are from the way to Sankaber. Pic 3: The impressive waterfall on the way to Geech. 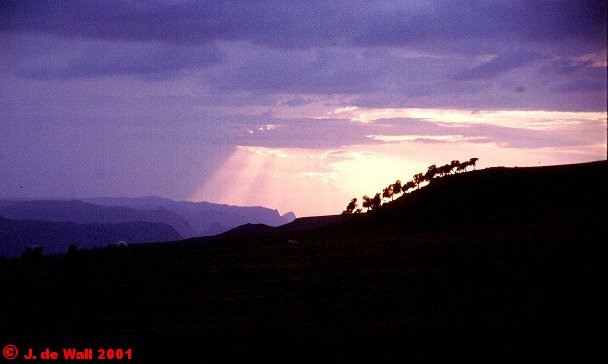 Pic 4: Sunset at Geech camp. 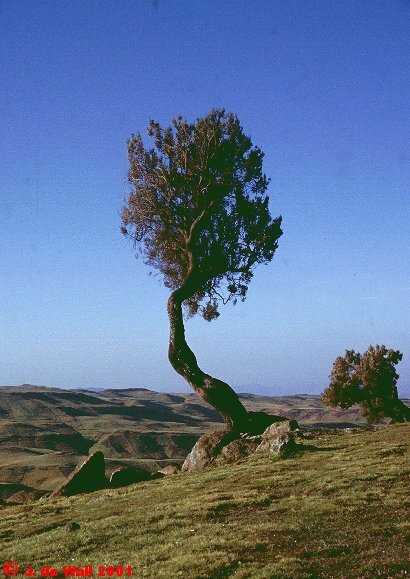 Pic 5: Hey, its........a tree!!!!! 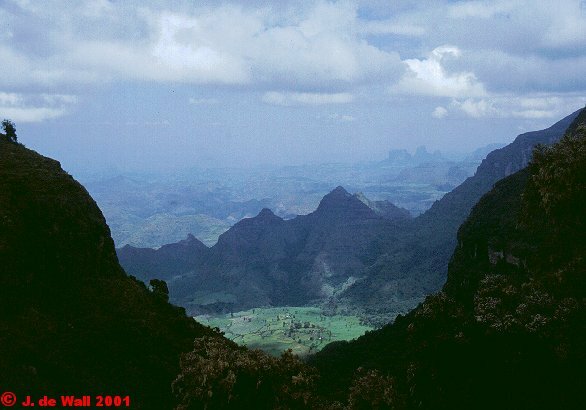 Pic 6: View from the view point Imet Gogo. 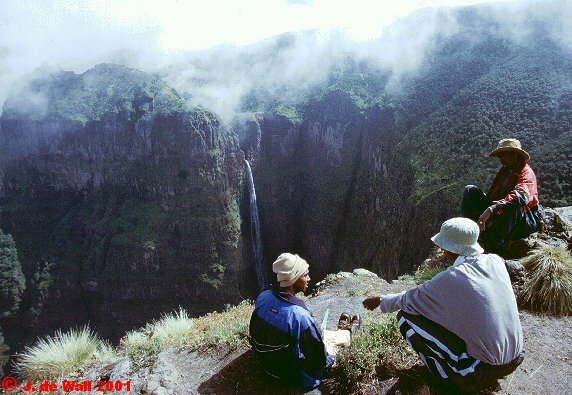 Pic 7: Our guide Wendru showing that he aint afraid of heights. 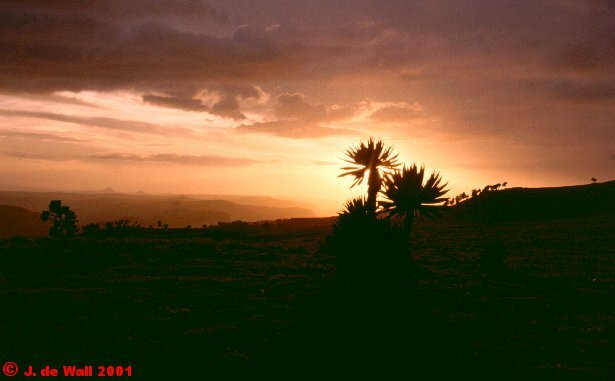 Pic 8: Another nice sunset. 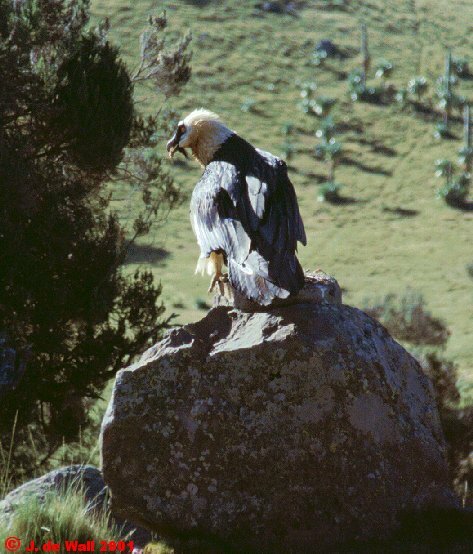 pic 6 : The impressive lammergeier. 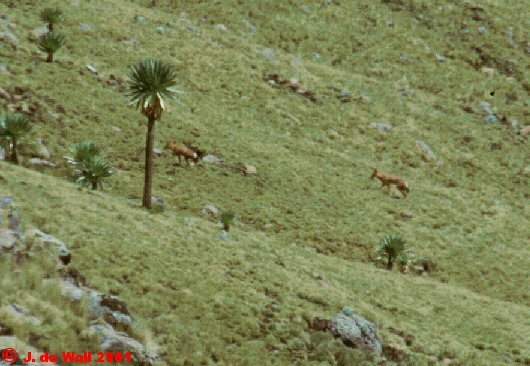 Pic 7: Two Simien foxes!! 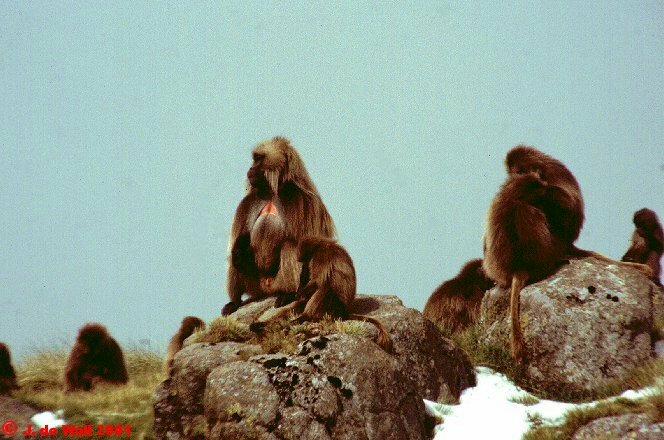 They are on the verge of extinction in the Simien mountains so it was very good to see two alive and well here. Unfortunately i didn´t get very close to them and i dont have a god tele so this hazy pic will have to do. Pic 8: Nice view just behind Chennek camp. Now Its time to bore you with another email. 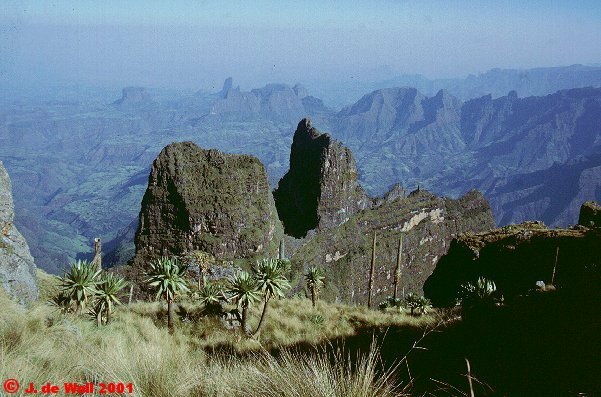 This one was writen on 8 november from Gondar, shortly after i returned from the Simien Mountains. WOW....found a cyber cafe here in Gondar ethiopia. This is surely a sign that progress is on the way. Hafta make it short though coz there is only 1 computer and people are waiting in line to use it. 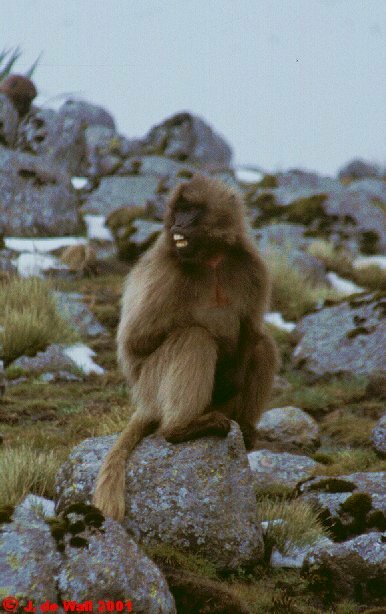 I just returned from a 8 day hike in the simien mountains. 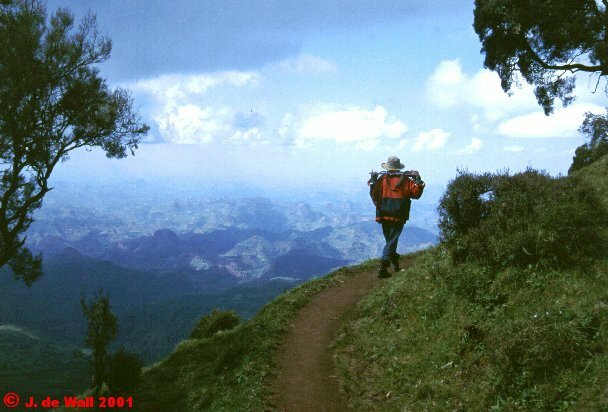 In Bahar Dar i met Heike en Sven, a charming German couple, and i decided to join them on a 8 day hike on hte mountains. I had a simply amazing time. 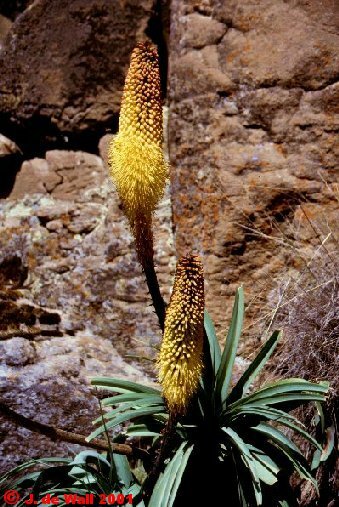 I saw lots of wildlife; Gelada Baboons, Lammergeiers, a lt f birds, Walibi Ibex, Klipspringer and......two Ethiopian wolves!!! 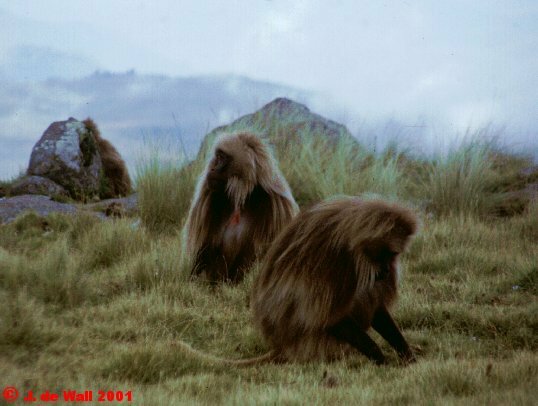 They are said to be extinct here in the Simien mountains so it was good to see 2 of them alive and well. Ed; you wanted to see pictures of animals ....well...i think i took a few that might interest you. Combine that with the most dramatic mountains scenery africa has to offer and i had probably the most rewarding mountain hike of my life! 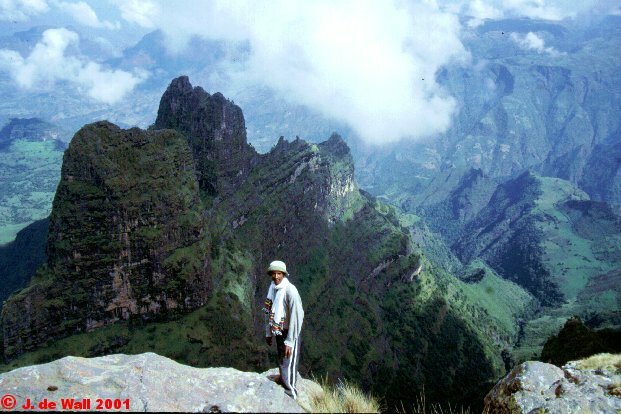 Tomorrow i will fly to Lalibela with its fabled rock hewn churches. I wonder what kind of surprises await me there. 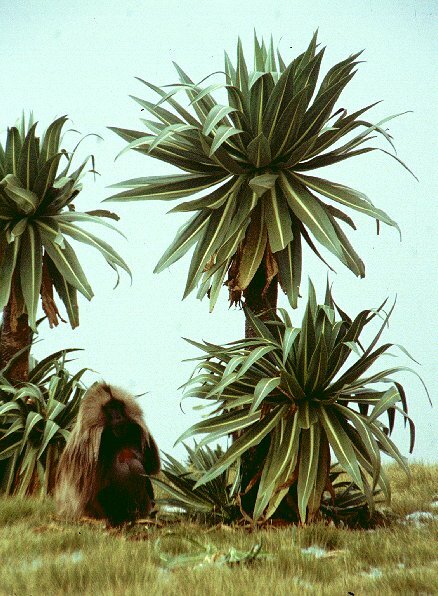 Now off to see something of Gondar. Mail you again in a couple of days from Addis Abeba!